The Indian Express has the sad news that Beverly Giesbrecht held captive for two years by the Taliban, has been reported to have died. If you want to know more about her background, this is worth a peek. Here is a piece Terry Glavin wrote 18 months ago, after this poor woman had appeared in a video appealing for her release. One would certainly not want any harm to come to this pathetic and obviously unwell individual, but it does not help her case, or the public’s understanding of what is really going on here, to persist in the fiction that she is a “Vancouver journalist” who has been kidnapped in Pakistan. It is even more ridiculous to keep on regurgitating this business about how the sorry tale begins with Giesbrecht having “converted to Islam.” And if there is any truth at all to the widely-reported explanation that she was in Pakistan on some sort of assignment from Al Jazeera’s English-language service, then heads really should roll, starting with the head of the boss. To begin with, Beverly Giesbrecht – also known as Bev Kennedy, Zafir Jamaal, Ubaidah Al-Saif, Paul Morris-Read, and so on, is a West Vancouver businesswoman and recovering alcoholic with some entrepreneurial background in digital-media development and publishing, but not real journalism. In the course of her struggle with the bottle she became an avid Jesus enthusiast of the Southern Baptist variety, then suffered what appears to have been a psychotic episode after gazing for some long while, by her own account, at a picture of Osama bin Laden. 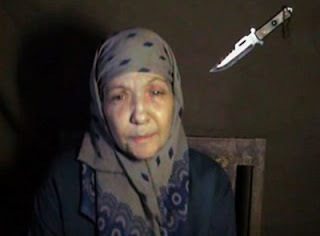 Giesbrecht ended up formally changing her name to Khadija Abdul Qahaarand, and she appears to have then devoted her life to the dissemination of jihadist propaganda, primarily through a website she set up under the name “Jihad Unspun.” There may well have been even more to this enterprise than meets the eye: Her activity was so outlandish, so far removed from anything resembling journalism, and so outwardly partisan to the point of attempting to assemble a network of jihad-minded Arabic-speakers, that she was widely and not unreasonably suspected of being a part of some poorly-executed American counter-terrorism intelligence-gathering operation. In any case, to explain this poor woman’s sordid behaviour as being somehow a consequence of her having “converted to Islam” after September 11, 2001 is precisely the kind of casual insult to Muslim people, ubiquitous these days, that displays a willful ignorance of the very real Islamist fascism that is tormenting and terrorizing millions of Muslims around the world, commonly employing the mentally ill to do its dirtiest work. It’s the same as saying that some emotionally unstable real-estate agent who marries into the Phelps family in order to join the Westboro Baptist Church is merely a person who has “converted to Christianity.” It should stop, not only because it is inaccurate and vulgar, but because it conceals rather than reveals anything about Giesbrecht’s predicament. She didn’t simply stop being a Baptist and start being a Muslim. She became a nutter, or more precisely, she became even more of a nutter than she already was. The misreporting and commonplace inaccuracies one encounters in most accounts of Giesbrecht’s calamity are a disgrace to conventional journalistic standards. It is no small irony that in a story the purports to be about a “Vancouver journalist,” Giesbrecht’s only connection with any journalistic enterprise that one can draw from what is known about her misadventure in Taliban country is her own dubious claim that she was there doing work for Al Jazeera. If there is even a scintilla of truth to this – which Al Jazeera has refused to discuss and has declined to acknowledge either way – then everyone at Al Jazeera who encouraged this poor deluded crackpot in her misbegotten mission should be fired, and the entire network should be held morally, legally and financially accountable. That is what the otherwise-sensible Canadian Journalists for Free Expression (CJFE) should be looking into, rather thanpassing this off as a case of an Al Jazeera journalist from Canada who has found herself in a bag of snakes. CJFE supporters, of which I am one, should take care to protect journalists and journalism, not least from the irresponsibility of management. One doesn’t do the cause of free journalism anything but harm by engaging in lousy journalism, and then drawing frauds and lunatics within the embrace of journalism’s empathy and solidarity. It makes matters worse and more dangerous for real journalism, and real journalists. UPDATE: If you can stop yourself from choking on such obfuscations as the description of Jihad Unspun as merely “an aggregation Web site for news and opinions related to the Middle East and the United States ‘war on terror’,” you’ll get a more complete picture of just how deeply disturbed this poor woman was, here.